As E.V. 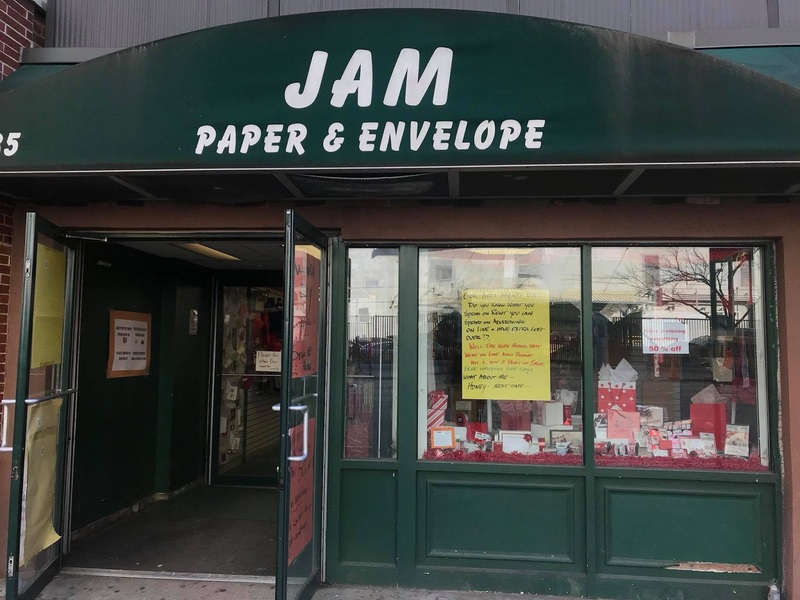 Grieve reported earlier this month, JAM Paper & Envelope is closing on Third Avenue near 14th Street. 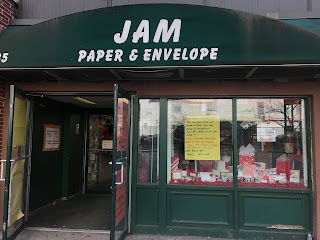 They started business in 1954 and opened their first shop in 1983. Today is the last day. This week, some interesting signs went up in the windows that might tell us something about the closure. Reads one: "So my wife of 40 years says... Honey, no one shops retail anymore. That's why we are online. Fine, I say. She then says, Now we can go to Florida." The next is a list of "Facts I Remember," including "People saying please and thank you," "Talking instead of texting," and "Shopping in stores." 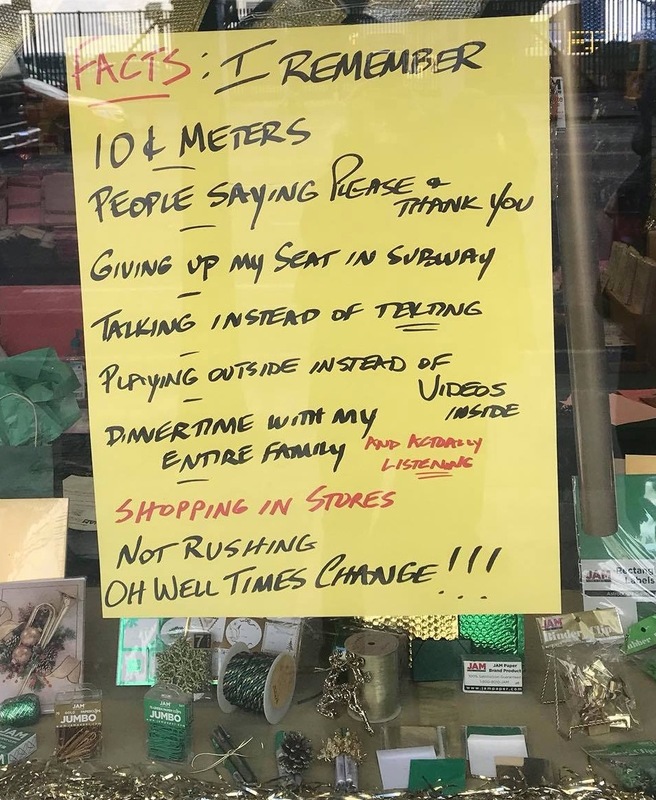 So maybe we chalk this one up to the changing demographic in the East Village, a new population that prefers to shop online, rather than engage with the local commercial culture. As many long-time residents have noted, the hallways of our buildings fill up with packages as new people move in. 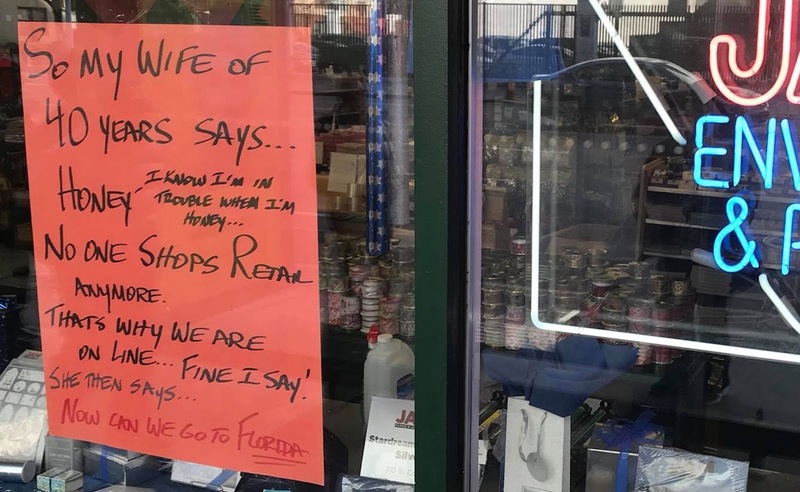 I don't think it's a new demographic that's causing more people in that 'hood to shop on-line. Rather, it's that the on-line shopping technology has become ubiquitous and more and more people at every rung on the socioeconomic ladder are using it. Or possibly a combination; no doubt the demographics are indeed changing. I've been doing most of my shopping on-line for many years. With some exceptions (like, I used to love to go to Tekserve! ), I hate shopping. No doubt this is due to unhappy memories of my mother dragging me along on visits to Alexanders and S. Klein "On The Square" (in the very 'hood we're talking about at this moment). However, FWIW, I've gotten kinda tired of shopping on-line. So when I decided to get a humidifier recently, faced with the plethora of options available on Amazon, I instead walked over to my local PC Richard's and had the salesman help me pick out a model. He convinced me that the cheapest one would do for my needs. On Amazon, I would probably have picked something fancier. In fact, it's just fine. Inelegance rules! It's true everyone shops online some of the time, myself included. But every person I talk to who has lived in the E. Village for years will say that the new tenants get piles and piles of boxes delivered every single day. I see it in my building. That's a big shift. I wish someone would do some research into it. I see this all over NYC now. 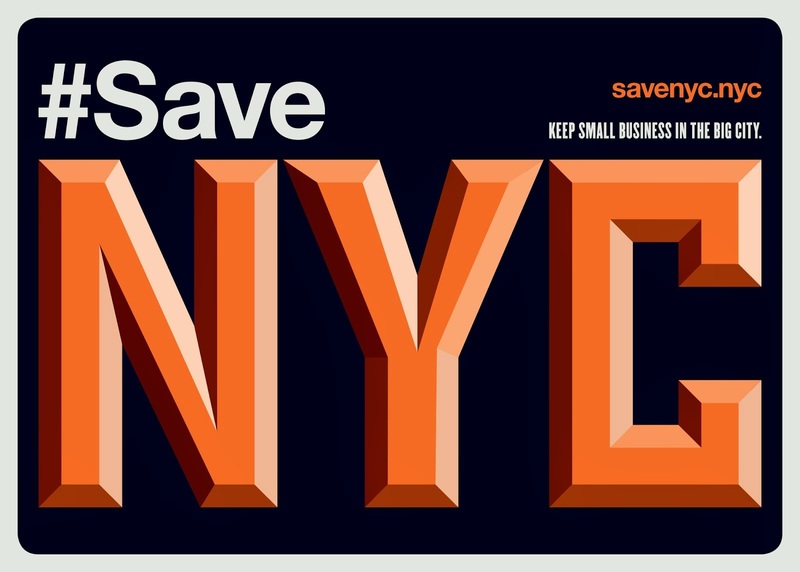 New York City has become so anti-business. The real estate taxes are too high. The city taxes, The sales taxes, the transit taxes. Landlords can keep their stores vacant for 20 years if they want and deduct the "market rent" from their taxes. This leads to a small group of landlords owning all the commercial properties and then dictating HIGH rents as they write off the empty space against their other buildings. There needs to be a law in NYC that after 3-6 months the landlord can't write off the same amount anymore. The city looks awful with block after block of VACANT storefronts. DRAT! Had I eewd this earlier I would have suited up, grabbed my cane and gone down for some last purchases because I have some art work ready to be mailed in various sized envelopes. Alas and alack, I'm an elder, slightly hobbled and make short trips locally for my needs. I live without credit, paypal ability, and on a short economic leash getting shorted daily as prices rise. Not yet extinct,I do no financial transactions on the web for fear of interference I can't afford. This is most stressful and sad. I hope they have a blissful retirement to wherever they go and a prosperous future on line. How much of this destruction is being driven by straight-up money laundering? Longtime long distance readers of my zine used to say they always looked forward to the random, colorful A7 envelopes from Jam's close out section in which it shipped. 25 for $2. Had I know, I would've gone and cleaned em out.